I think pears are annoying. Lovely, but annoying. They sit around in the fruit bowl looking all delicious and they’re never ripe. Then, when one is ready to eat the rest immediately go ripe too and then you have to eat them all at once. Well I’m not standing for it any longer, I decided that I would use the pears while they are under ripe so I can enjoy them while waiting for the others to ripen. The word ripe has lost all meaning. These mini toffee pear pies are made from surprisingly few ingredients (if you buy readymade pastry) and are just perfect for celebrating the pear in all its I’m-never-quite-ready-ok-now-I’m-too-ready glory. Start by making the pie filling. Chop the pears up into small chunks and get a frying pan on a low/medium heat. Add the butter and the sugar to the frying pan and leave to soften and mix together. Once you have a lovely, dark brown, smooth sauce tip the pears in and continue to cook for a few minutes so that the pears get well covered and the sauce thickens. Add the lemon zest. Put to one side to cool. Roll the pastry out on a floured surface to make it around half as big again. You will need two fluted pastry cutters: one 8.5cm and one 6cm. Lightly grease a 12 hole cupcake tin. Cut out 12 circles of pastry with the larger cutter and put these into the holes in the cupcake tin. Re-roll the pastry and cut out 12 circles with the 6cm cutter. Spoon the cooled pear mixture into each pastry case, top up each mini pie with any leftover caramel sauce. Brush the edge of the pastry cases lightly with milk and then put the smaller pastry circles on top. Seal with your fingers or a fork. Brush the tops of the pies with a little more milk, add a small steam hole in the top of each pie with a sharp knife, then sprinkle with a little caster sugar. Bake in the oven for 20-25 minutes or until the tops are golden brown. I served a few of them warm, straight from the oven with a drizzle of double cream. What a little piece of loveliness that was. The fruit inside is soft and slightly sharp, the toffee sauce has bubbled up onto the pastry and made a sticky, sweet edge and the pastry is warm and crisp. Adding the lemon prevents the pie from being overly sweet. These would be perfect to take on a picnic or to nibble on for bonfire night. Alternatively, and this is quite a niche suggestion, if you have a log burner, pop a couple of pies on a piece of foil on top of the burner and wait for them to get warmed through before serving with ice cream. I always love things mini :-)) These muffin pan pies with toffee pear filling look fabulous, Caroline. I love pears but you are right about the way they ripen. When we had loads of pears from our orchard in New England, I often poached a bunch of the hard ones. I know you would really enjoy your tiny toffee pear pies. SO. STINKIN. CUTE. And obviously so delicious. Love the toffee/pear combo! Thank you so much for sharing! I feel this deeply. Its a bit like avocados they sit for days not ripening and them boom eat them or miss out. I love this idea and it looks so tasty and so adorably small. Tough to get a pear at peak ripeness, isn’t it? But when you do, it’s SO worth it. Anyway, love these little pies — bet their flavor is marvelous. Thanks! Hi! 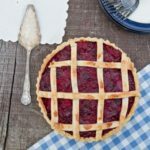 These pies look so easy- and I suppose you could solve your ‘ripe pear problem’ with this recipe. 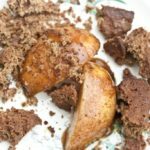 Who would know that you used over-ripe pears for this recipe- I suppose the taste would be the same! These are brilliant, Caroline! And I agree – I only buy pears when they are ready to eat, lest I end up with either rock hard or grainy, pasty fruit. Pears can be pretty annoying like that! These mini pies look cute and scrumptious! yum! a perfect portion! these are so cute and would be delicious too–nicely done! This looks SO yummy! It’s so true about the pears haha. I always buy them when they’re rock hard and wait patiently for them to ripen, then I look one morning and they’re ALL light green with brown spots forming. What a perfect way to use them up all at once! You are so right about pears, great way to use them up. Oddly I love under-ripe pears and seek out the firm ones. However once they turn ripe and soft they turn me off for out-of-hand eating, so actually this recipe is perfect for me! Love the idea of these adorable and flavorful little tarts. These are beautiful! 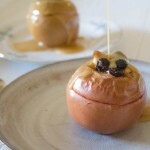 I’ve been all about pears this fall… and caramel, always!